Product prices and availability are accurate as of 2019-04-19 05:11:47 UTC and are subject to change. Any price and availability information displayed on http://www.amazon.com/ at the time of purchase will apply to the purchase of this product. This holster only fits: SpringField XD-S 3.3" 9mm / .40S&W / .45ACP Single Stack (Right Hand Draw Only) It is designed to be worn inside the waistband for concealed carry. CYA Supply Co. a member of NRA Business Alliance. We make our holsters with the end user in mind. We have put much attention to our materials, design and process to bring you a top of the line holster at a better price. Finally, you do not have to sacrifice quality for a good price! We have taken the major wear and friction points out of this holster. In most kydex holsters, makers mold straight to the shape of the gun, this includes the slide release, safety etc. By recessing this area we are able to create a smoother draw and re-holster. This also reduces the amount of holster wear on your gun. Our holsters are made from Boltaron thermoplastic, a similar plastic to Kydex. Boltaron is abrasion resistant, chemical resistant, and extremely durable. Boltaron out performs Kydex, the material most thermoplastic holsters are made from, in impact resistance, hardness, and keeps its shape better than Kydex in high heat situations. The cant of the holster is adjustable from 0 to 15 degrees, simply use the Hex Allen Key that is provided with your holster to loosen the screw on the belt loop and adjust. The retention of the holster can also be adjusted with the Hex Allen Key, by adjusting the two screws placed in front of the trigger guard. Holster has a Positive audible click when inserting the handgun into holster, this is done by making our molds with a groove in the trigger guard. As stated above, CYA Supply Co is veteran owned, and our holsters are made right here in the USA. Great State of Texas to be exact. Thank you for supporting American made small business. 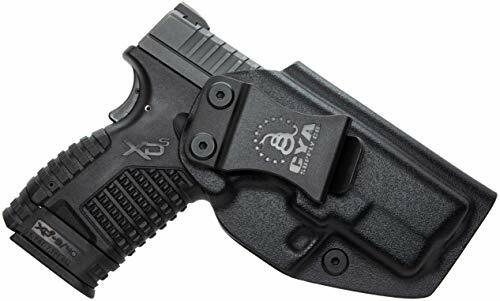 Fits only: SpringField XD-S 3.3" 9mm / .40S&W / .45ACP Single Stack - No Light/Laser Attachments (Right Hand Draw Only) IWB Holster - Inside The Waistband - Easily Adjustable Retention Pressure & Carry Angle (Cant) 0-15 Degrees Made of .08" Thickness Boltaron Material - Belt Clip 1.5" wide - All Stainless Steel Black Powder Coat Hardware Posi-Click' Audible Retention Lock System - Sweat Guard covers full length of slide Made in USA - WE STAND BY OUR QUALITY: 100% Satisfaction Guarantee, No questions asked return policy and Lifetime Warranty.